Toribird here, bringing you some breaking birding news that I find very exiting! Quite a few birders, myself included, have noticed a remarkably large number of Purple Finches this fall. It seems like this will be a good irruption year for them - a year when birds move in substantial numbers outside their typical range. A few Purple Finches come down from the northern U.S. and Canada every year to spend the winter, but typically fewer than this year. This is a natural movement, likely caused by a good seed year, allowing the finches - seed eaters- to raise many chicks, causing a population bulge. The Woodlands is an excellent spot for House Finches, so I bet Purple Finches will hang out here as well! Now, if you've been a birder for a little while already, the back of your brain may be going "Oh no, aren't Purple Finches very similar to House Finches!? How will I be able to identify anything?" Have no fear, Toribird is here!! (I had to. Sorry.) Yes, House and Purple finches look alike, but the males in particular can be told apart with a few tricks. Not really purple, but a magenta or raspberry red. Also, Purple Finches are the 'pretty' finch. Think P for purple and pretty. The males have more color than House Finches, and the females have a much clearer face pattern and more defined stripes than the houses. Purple Finches aren't the only bird coming down in larger-than-usual numbers this year. Several winter sparrows like the Lincoln's Sparrow and the beautiful White-crowned Sparrow are in the area. They like grassy areas, so maybe check out the small meadow near the mansion at The Woodlands or the field at Bartram's Garden, as well as any other area like this you may know of to spot this year's special treats. 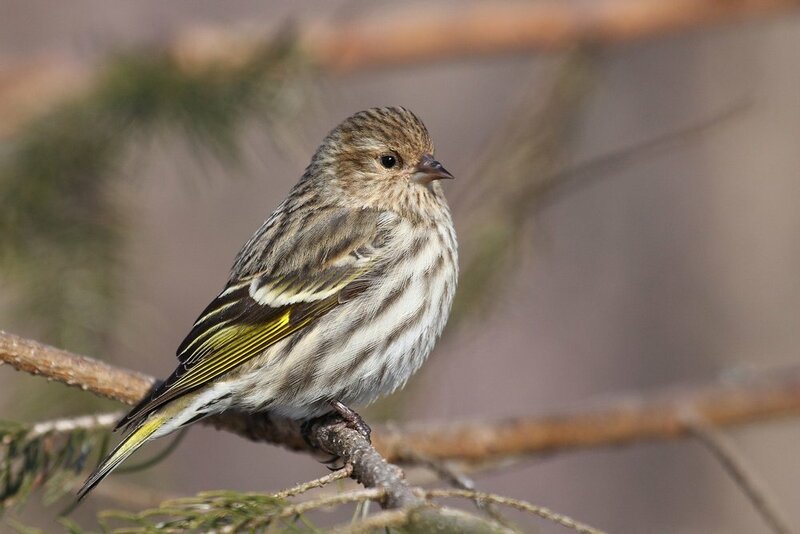 A Pine Siskin shows off the yellow in its wings and tail. Photo from Wikimedia Commons. Finally, the Pine Siskin has been seen in the area, though they are a fair bit rarer than the other birds mentioned on the blog. They are finches, striped brown and white not unlike the female House and Purple Finches. However, they have thinner bills than similar species, and distinctive if subtle yellow in their wings and tail, bolder in the male but present in both sexes. Get out birding and keep your eyes peeled for this rarity as well as all the other birds that have come down to visit this year! In honor of Veteran’s Day, Kathie Brill, our newest intern from the Historic Preservation Department at UPenn has highlighted the stories of two notable Veterans buried at The Woodlands. She is also taking over our Instagram account this week, sharing her perspective as a new Philadelphia resident and frequent visitor of The Woodlands. Emily Bliss Souder was a volunteer nurse at the Battle of Gettysburg during the American Civil War. She lived in Philadelphia with her husband and 4 children. At that point in time, formal organization for trained nurses in the United States had just come to life. In 1861 A woman named Dorothy Dix ”was appointed Superintendent of Female Nurses of the Union Army by Secretary of War Simon Cameron. She was empowered to create a volunteer nurse corps and regulate supplies that were donated to the troops.” (Stanley B. Burns, Nursing in the Civil War, 2009). So, women like Emily Souder and her contemporaries, upon the hearing of significant combat, made the pilgrimage out to scenes of post battle devastation along with doctors, surgeons, and members of the Sanitary Department. Between five and ten thousand women offered their services in the medical field during the Civil War. The book “Leaves from the battlefield of Gettysburg; a series of letters from a field hospital; and national poems” is a published collection of letters and poems written by Emily Souder describing her nursing experiences. She writes “of the great and pressing want of kind Christian women, who can minister to the bodily suffering and also to the spiritual wants of our poor soldiers…how sorely stricken and wounded our noble soldiers are, and how grievously these rebel wounded are suffering and both lying side by side like brothers.” I recommend reading the entire book which lucidly depicts an inside account of the gruesome aftermath in the weeks following the Battle of Gettysburg, and the crucial role women played during that time. It also provides a glimpse of war in the context of a time period with a limited amount of treatments and technology in the medical world, in comparison to what exists today. Burns, Stanley B. “Nursing in the Civil War.” PBS, Public Broadcasting Service. Sylvester Bonnaffon Jr. entered the army in 1861 in the 99th Pennsylvania Volunteer Infantry. Throughout the Civil War he worked his way up through the ranks eventually becoming a Colonel in April of 1865. He is one of two Civil War Medal of Honor recipients buried at The Woodlands. He received the award for “’distinguished gallantry at the at the battle of Bodyton Plant road, Virginia, October 27th 1864. [Where he] checked the rout and rallied the troops of his command in the face of terrible fire and musketry.’” (Benson, Benson, & Wiedersheim 1992) He was injured during this battle. He was mustered out of the 99th Infantry in 1865 but continued to serve in First Regiment Infantry in the National Guard of Pennsylvania, as lieutenant and then captain. He was honorably discharged in 1874, and then was called to emergency service from July to September of 1877 as a Colonel in the Twentieth Regiment Emergency Infantry. He then Major of the Artillery Corps, Washington Grays Batillion and finally the Colonel of the Third Regiment Infantry, National Guard of Pennsylvania until 1890. During his time with the Third Infantry he built the Armory at 12th and Reed Streets which was completed in1882. His Son, Sylvester Bonnaffon III, continued the legacy of military service serving as a US army officer during the Spanish American War and WWI. Benson, Edwin N., et al. History of the First Regiment Infantry, National Guard of Pennsylvania. University Publications of America, 1992. The Woodlands played host to our first ever Wedding Open House just before Halloween, made even more special as we performed the (fake) nuptials of Frankenstein's monster and his bride! Our eponymous creatures celebrated their wedding in the historic Hamilton Mansion, surrounded by engaged couples looking to plan weddings of their own. Joining us were the following vendors: Chef's Table (catering), Lil Pop Shop (dessert), Snapdragon (florist), No Macarena (DJ), Liberty and Lace (gown), Elegance Artistry (hair & makeup), and Ocean Tents (party rentals). And please (trick or) treat yourself to the photographs captured by Lora Reehling. Thank you to all the vendors and guests who joined us for this monstrous and momentous occasion. Thank you to our Monster and Bride, actors Dante Piombino and Amanda Schoonover. The Woodlands Gobble Wobble: An adventure in urban running and wild turkeys. Toribird here, to remind you that along with hot cider, first frosts, and colorful trees, another fall tradition not to be missed is the Woodlands Gobble Wobble 5k this Saturday November 3rd at 10:00AM! Come run to support your favorite urban cemetery while enjoying the scenic and historic grounds! Register in advance, or on race day starting at 9:00AM. “Gobble Wobble” is a cute name because of the tradition of eating turkey on Thanksgiving, but did you know that Wild Turkeys have been seen right here at the Woodlands, in addition to many other places in Philly? Wild Turkeys are native to North America, and rather widespread. They usually like to hang out in fields near forest edges or in laws with several trees. They seem to be happy to live near people, though they also inhabit very rural areas. Unlike their domestic relatives, Wild Turkeys can fly. They usually prefer to walk, however, flying up to trees only to roost at night. 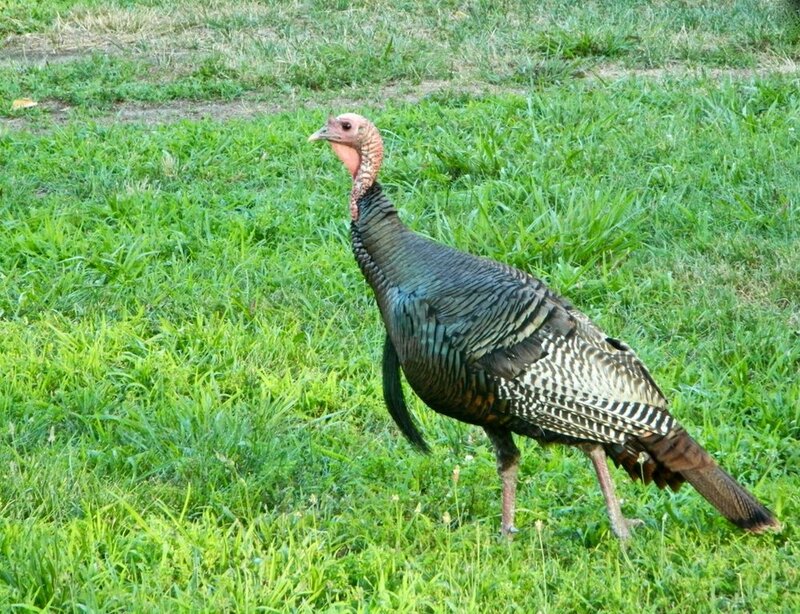 The Woodlands is not the most reliable place for turkeys, though they have been spotted here a few times in past years. If you're just not having any luck, however, try Bartrams Garden, another urban jewel. Birding at The Woodlands: You Never Know What You'll See! This is especially true as right now is prime time for migration! All kinds of birds, from eagles to songbirds, are crossing continents, some by day, some by night. Some make shorter journeys, not leaving the country, yet others will travel all the way to Argentina! Some birds, like the Northern Rough-winged Swallow will leave the Northeast for now, and others, like the White-throated Sparrow will join us for the winter. This same Red-tailed Hawk is shown in the video later in the blog. Photo taken at the Woodlands by Toribird. Many warblers are currently on the move. However, they can be a real challenge to identify in the fall as almost all have changed from their bright spring colors to drab, olive-green plumage with significantly less variation between species. However, two warblers that are still easy to recognize are the Black-throated Blue and Black-and-White Warblers. These little birds are passing through Philly on their way South. Both are conveniently well-described by their names: the male Black-throated Blue Warbler has a steely-blue back, a black throat and mask, and white underparts. Black-and-White Warblers are simply striped black and white. They like to act like little woodpeckers, crawling vertically on trees. An Osprey striking a pose for the camera. Photo by Toribird. Many species of birds of prey are also traveling right now. Keep your eyes to the sky, as many will be flyovers, just trying to cover distance and not hunting or landing. 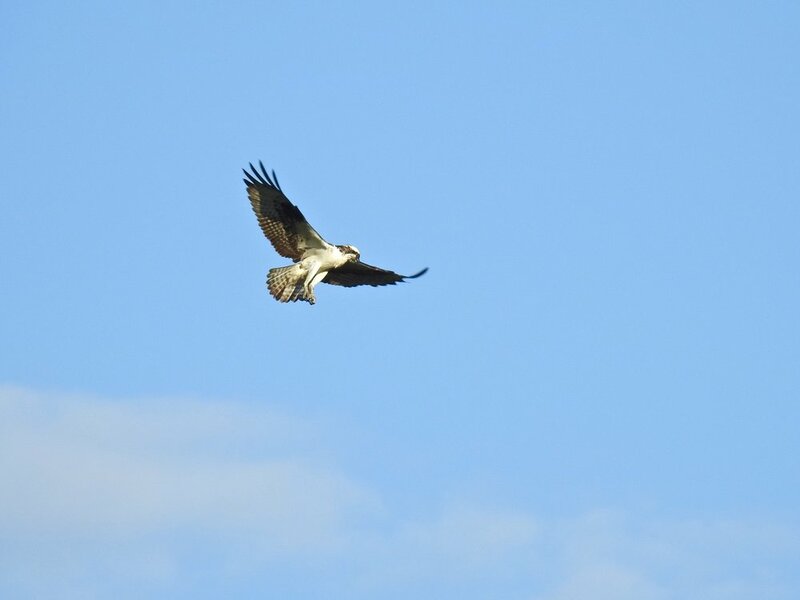 You could see Bald Eagles and Ospreys, or falcons like American Kestrels and Merlins. Many hawks like the Sharp-shinned Hawk and Red-shouldered Hawk will also be passing through. Keep in mind, though, that most will be in flight, and sometimes distant or backlit. Test your ID skills on these migrants, but don't fret if you can't always pin down a species. Sometimes, they are best left as the ever-common Black Dot in the Sky Bird. Speaking of hawks, check out this video of a Red-tailed Hawk, a common bird in Philly, eating a chipmunk at the Woodlands! I caught the resident cemetery Red-tail eating a light dinner of a chipmunk in September 2018. Interested in coming on one of my (Toribird’s) bird walks? I will be leading two on Sunday, October 21 as part of Halloween Family Fun Day. They are geared for beginner birders, but all skill levels are always welcome! We can expect to see birds like flickers, starlings, robins, and House Finches, among others. If you’ve wanted to try birding the Woodlands but have been a bit hesitant, a guided walk could be a good way to start.